Tom Ford introduces a fragrance that captures the essence of his menswear philosophy. TOM FORD GREY VETIVER is a masterful new rendition of the cool and intriguing possibilities of vetiver, an ingredient that Ford says has always been a hallmark of a classic, tailored and unabashedly masculine man. "Vetiver immediately evokes for me the classic man, someone who has a confident, refined, and slightly traditional sense of what it means to be a man-an elegance that is mirrored in TOM FORD clothing. It's one of my favorite fragrance notes because it is timeless, grounded and has an enormous amount of character." He adds, "Almost everyone recognizes vetiver and has an association with the aroma; it is the fragrance equivalent of the classic blue blazer, the beautiful watch or the cap-toed shoe." TOM FORD GREY VETIVER has been crafted around the most authentic vetiver note available and moves it from the background-the ingredient's traditional placement in many fragrances-to a signature placement from top note through long-lasting dry down. A celebration of this iconic material, vetiver's intriguing mix of cool, dry, and rich-woody qualities are enlivened and illuminated to the fullest. Vetiver Nature-Intact obtained by a revolutionary extraction technique and used here for the first time in perfumery, is employed to capture this ultra-pure essence of Vetiver. To construct Grey Vetiver's stunning character, this exclusive extract is used in far greater quantity than vetiver is traditionally used in many scents. Surrounded by notes selected to support and enhance the Vetiver signature, the result is an extremely luxurious fragrance that is powerfully recognizable: TOM FORD GREY VETIVER is a composition of silvery, tailored elegance over a background of compelling, grounded warmth. The surprisingly fresh aspect of Vetiver is enhanced with sparkling orange flower and grapefruit notes, as aromatic sage develops the ingredient's masculine character. Warm woods wrap this top layer, balancing but not overwhelming the dry coolness for which vetiver is famous. As the full impact of Grey Vetiver's exclusive vetiver extract begins to unfold, its fascinating richness blends with a wash of golden, warm amber woods, while oakmoss enhances the green and woodsy aspect of this special ingredient, ensuring it never emerges as too earthy or pungent. This trio of important notes harmonizes in the dry down to let TOM FORD GREY VETIVER float coolly on the skin while subtly melting into the body's heat at the same time. 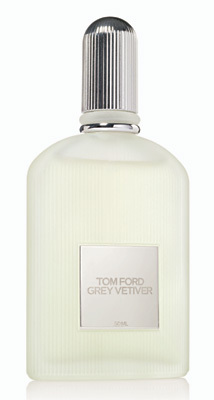 TOM FORD GREY VETIVER is a pale juice encased in a frosted 50 ml version of the iconic TOM FORD FOR MEN fluted bottle. The cool, white-silver coloring of the packaging expresses the silvery character of vetiver. The familiar bottle design is given several customized details for this third fragrance from Tom Ford, including a silver-toned cap and neck ring, and a palladium plaque embossed with the TOM FORD logo. The bottle is packaged in a silver-toned, fluted carton bearing silver foil accents and borders, and a shiny silver label that bears the fragrance name in black.